Purísima means "purest" in Spanish and is most commonly used in Spanish to refer to La Purísima Concepción (the Immaculate Conception) of the Virgin Mary. Historical misspelling in English resulting in double "s" which, as you can see is how the Iris was registered.Well used in iris breeding in the Thirties, Forties, and Fifties. Has a New Zealand connection, first used by Jean Stevens in her 1936 breeding programme as a pod parent and the first cross recorded was M7 Purissima X Inspiration although no seedlings were finally selected. 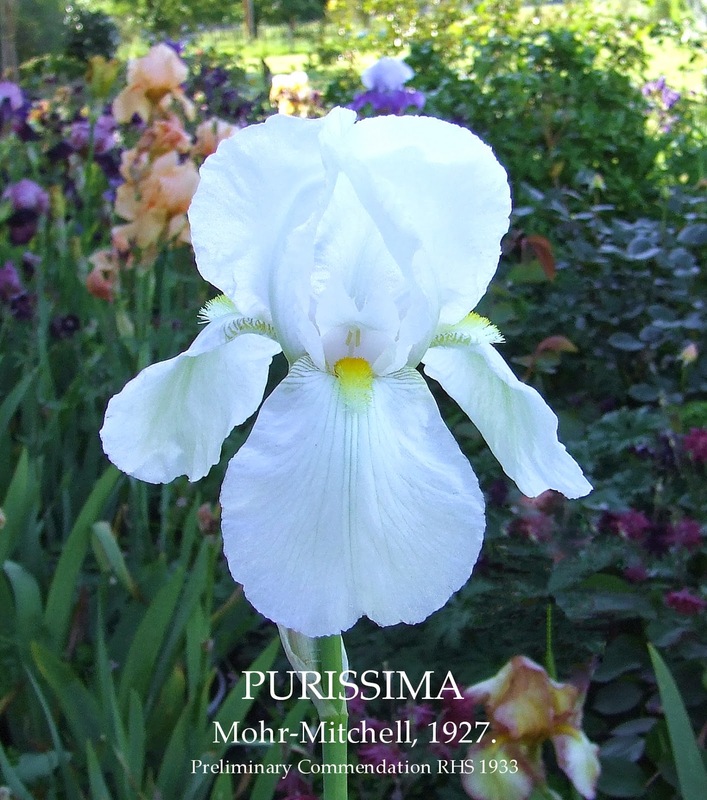 The hybridiser Pattie Levett who lived at the family homestead "Beccles" in a small North Island town called Bulls used Purissima in the parentage that produced a beautiful creamy white Tall bearded Iris 'Wychnor'. In America, lets not forget Purissima was the Pod parent to that game changer of hybridising the amazing 'Snow Flurry'. Also parent of Helen McGregor, Her Grace, Mary Rich Lyon, Pike's Peak Pink, grandparent of Cahokia, Pierre Menard, and Sleighride. Irises for Every Garden. History of Bearded Irises. Sydney B. Mitchell. In the perspective of thirty-five years it is now possible to rate William Mohr the outstanding American breeder. 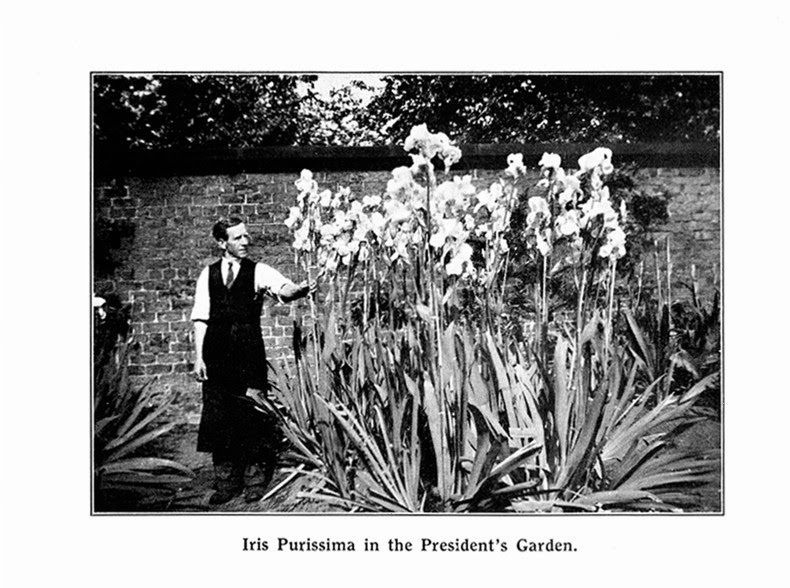 Through is work with Iris mesopotamica and Foster's Kashmir White, American breeders were given in the late twenties such outstanding irises as Conquistador, bred from the diploid Juniata by the huge ungainly mesopotamica; El Capitan bred from Oriflame by mesopotamica; Purissima which came from a seedling of Caterina by Kashmir White crossed with Conquistador ; the epoch-making tetraploid plicata's, San Francisco and Los Angeles and many others. Rainbow Fragments, J. Marion Shull, published 1931. A List of Better Varieties. Whites. The supreme white self has not yet appeared, and this group includes none that has earned a rating of 90 or more at the hands of any considerable number of judges. Kashmir White and White Queen have won the same rating as Taj Mahal, but the former is not always a dependable grower. Purissima though rated very highly by a very small number of judges, does not promise to live up to a somewhat over-pretentious name, since it does not appear to be purer white then the ubiquitous Florentina, with which everyone is familiar, however much finer it may be in other respects. Cooley's Iris Gardens, Silverton, Oregon, Bearded, Japanese, Spanish and Dutch Irises, 1932. Quality Gardens, Iris, Freeport, Illinois. Iris 1933. Bulletin of the American Iris Society, January 1933, Number 46. VARIETAL NOTES From England, Australia, and Elsewhere (editorial comments added). PURISSIMA (Mohr-Mit.) The finest white. I cannot conceive of anything finer; 5-5½ft., perfect in every way. England. Mr. Pilkington must be impatient to see the flock of American whites of which the New England Committee has selected Easter Morn, Polar King, and Venus de Milo as of equal interest to the connoisseur. Ed. National Iris Gardens, Beaverton, Oregon, 20th Catalog, 1936. PURISSIMA (Mohr-Mitchell, 1927) E, 48". The finest pure white Iris. Roots are tender and it is not recommended for the more northern states (for which Easter Morn and Los Angeles are more suitable), but grows well on the Pacific Coast and south of the Mason & Dixon line. A normally flowered stalk is a never-to-be-forgotten sight. Perfectly branched with finely shaped flowers. Carl Salbach, Berkeley, California. Iris and selected seed Specialities.1937. Stevens Bros, Bulls, New Zealand, Catalogue of Irises 1937-38. This splendid flower still sets a mark of perfection and purity unequaled by any other iris. A pure white of great poise, fine form and heavy substance. With the sun shining through it, this has the appearance of frosted glass...........................................................4½ft. Iris 'Purissima' in the garden of British Iris Society President G. L. Pilkington. The Iris Yearbook (BIS), 1942, Bearded Flag Irises-An Initial Thirty, F.Wynn Hellings. PURISSIMA (Mohr-Mitchell, R. 1927). TB, M. WW. Argentina X Conquistador. Preliminary Commendation RHS 1933. Salbach 1927. This is so gorgeous! We have had a mild winter and my 'Purissima' plant is just now putting up a bloom stalk. The individual buds are really huge. Do you know if this is a tetraploid? That photograph of stalks that must be 6 feet high is simply awesome!!! Yes it is a tetraploid with a recorded chromosome count of 47 made by L.F. Randolf , Purissima parents chromosome count are Argentina 50 and Conquistador has a count of 49.